The Hallmark Health Stride for Healthy Communities 5K takes place on Saturday, September 30th. This Saturday morning race starts at 9 AM. Registration and bib pick up begins at 8 AM. With hospitals in Melrose and Medford and out-patient services provided in Reading and Stoneham, Hallmark Health truly serves our Communities. Proceeds from the Stride for Healthy Communities benefit Hallmark Health family health services such as CPR training for high school students, diabetes education and other initiatives to keep our communities healthy. This flat course around Lake Quannapowitt in Wakefield is very popular because it offers plenty of free parking and a nice flat course. This child friendly race offers registration for children 12 and under for only $15. 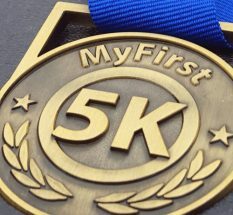 Registration includes a “My First 5K” medal for all children under 12. If you are thinking about running an early fall 5K with your child, this would be a great one. The course is flat and every child 12 and under receives a high quality medal to commemorate their first 5K race. Teen and adult registration is $25 pre-registered and $30 day of. If your child is 13 or older, or your running partner is older, My First 5K medals will be available for purchase at the race for $10.00. All proceeds benefit Hallmark Health family health services. After the race there will be music, giveaways and fun for the whole family. Be sure to stick around for the awards ceremony and enjoy a beautiful September morning along the lake. The Melrose Running Club will also be at the race. Be sure to stop by their tent to learn about the club and their Walk to Run program. The Melrose Running Club Walk to Run program has been helping new runners for over 10 years. The Melrose Running Club is a community partner with Hallmark Health to bring you and your family a fantastic running experience.